Todd Carroll has a vast experience when it comes to pitching. He has coached in numerous programs, at various levels, and has dealt with a variety of skills. 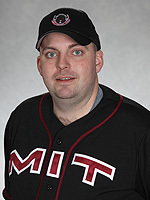 His coaching stints have included: UMass-Boston, Salem Community College, Harvard University, Mill City All Americans of the New England Collegiate Baseball League, Wareham Gatemen of the Cape Cod Baseball League, Head Coach of the Bennington Bombers of the New York Collegiate League, and MIT. The MBCA is excited to learn about Coach Carroll’s diverse knowledge and teaching experiences when it comes to pitching.